^ Nicolle 2003，第21 and 32页. ^ 4.0 4.1 Fletcher 1987，第34页. ^ 5.0 5.1 Nelson 1978，第697页. ^ 10.0 10.1 Treadgold 1997，第8 Graph 1页. ^ Asbridge 2004，第17页; 关于乌尔班的个人动机，可参阅19 - 21页. ^ 23.0 23.1 Vryonis 1971，第85–117页. ^ 49.0 49.1 49.2 Neveux 2008，第186–188页. ^ 53.0 53.1 Riley-Smith 2005，第28页. ^ 60.0 60.1 Tyerman 2006，第103页. ^ 77.0 77.1 Hindley 2004，第37页. ^ 81.0 81.1 Asbridge 2004，第163–187页. ^ 90.0 90.1 90.2 90.3 90.4 90.5 Tyerman 2006，第153–157页. ^ 92.0 92.1 92.2 92.3 92.4 92.5 92.6 Tyerman 2006，第157–159页. ^ 98.0 98.1 Baldwin 1969，第340页. ^ 99.0 99.1 Baldwin 1969，第341页. William of Tyre (编). A History of Deeds Done Beyond the Sea. Asbridge, Thomas. The First Crusade: A New History. Oxford. 2004. ISBN 0-19-517823-8. Baldwin, Marshall W. A History of the Crusades: The First Hundred Years. Madison, Wisconsin: University of Wisconsin Press. 1969. ISBN 978-0-299-04834-1. Bartlett, Robert. The Making of Europe: Conquest, Colonization and Cultural Change 950–1350. Princeton. 1994. ISBN 0-691-03780-9. Chazan, Robert. 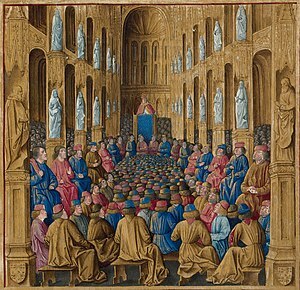 In the Year 1096: The First Crusade and the Jews. Jewish Publication Society. 1997. ISBN 0-8276-0575-7. Cowdrey, H .E. J. The English Historical Review. 1977. Edgington, Susan B. The Crusades and their Sources: Essays Presented to Bernard Hamilton. Erdmann. Die Entstehung des Kreuzzugsgedankens. 1935. Fletcher, R. A. Transactions of the Royal Historical Society, Fifth Series. 1987. Gil, Moshe. A History of Palestine, 634–1099. Cambridge University Press. 1997. ISBN 0-521-59984-9. Hamilton, Bernard; France, John; Zajac, William G. The Crusades and their Sources: Essays Presented to Bernard Hamilton. Ashgate. 1998. ISBN 0-86078-624-2. Hillenbrand, Carole. The Crusades: Islamic Perspectives. Routledge. 2000. ISBN 0-415-92914-8. Hindley, Geoffrey. A Brief History of the Crusades: Islam and Christianity in the Struggle for World Supremacy. London: Constable & Robinson. 2004: 300. ISBN 978-1-84119-766-1. Holt, Peter M. The Age of the Crusades: The Near East from the Eleventh Century to 1517. Longman. 1989. ISBN 0-582-49302-1. Hotaling, Edward. Islam Without Illusions: Its Past, Its Present, and Its Challenge for the Future. Syracuse University Press. 2003. ISBN 978-0-8156-0766-3. Housley, Norman. Contesting the Crusades. Malden, MA: Blackwell Publishing. 2006. ISBN 1-4051-1189-5. Konstam, Angus. Historical Atlas of the Crusades. Mercury Books. 2004. ISBN 1-904668-00-3. Lock, Peter. Routledge Companion to the Crusades. New York: Routledge. 2006. ISBN 0-415-39312-4. Madden, Thomas. New Concise History of the Crusades. Rowman & Littlefield. 2005. ISBN 0-7425-3822-2. Magdalino, Paul. The Byzantine Background to the First Crusade. Canadian Institute of Balkan Studies. 1996. （原始内容存档于2007-08-13）. Mayer, Hans Eberhard. The Crusades. translator:John Gillingham. Oxford. 1988. ISBN 0-19-873097-7. Michael the Syrian (编). Chronique de Michel le Syrien. Munro, Dana. American Historical Review 11. 1906. Murray, Alan V. Collegium Medievale. 1990. Neveux, Francois. The Normans. translator:Howard Curtis. Robinson. 2008. ISBN 978-1-84529-523-3. Nicolle, David. The First Crusade, 1096–99: Conquest of the Holy Land. Osprey Publishing. 2003. ISBN 1-84176-515-5. Peters, Edward. 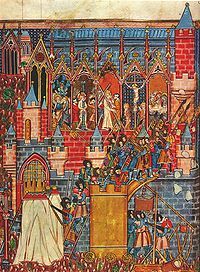 The First Crusade: The Chronicle of Fulcher of Chartres and Other Source Materials. University of Pennsylvania Press. 1998. Riley-Smith, Jonathan. 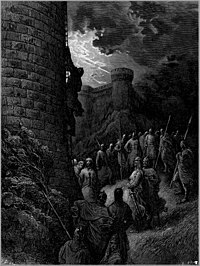 The First Crusade and the Idea of Crusading. University of Pennsylvania. 1991. ISBN 0-8122-1363-7. Riley-Smith, Jonathan. Bulletin of the Institute of Historical Research. 1979. Riley-Smith, Jonathan (编). The Oxford History of the Crusades. Oxford University Press. 2002. ISBN 0-19-280312-3. Riley-Smith, Jonathan. The Crusades: A History 2nd. Yale University Press. 2005. ISBN 0-8264-7270-2. Riley-Smith, Jonathan. 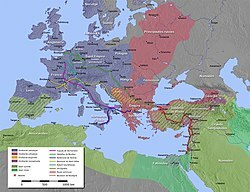 The First Crusaders, 1095–1131. Cambridge. 1998. ISBN 0-521-64603-0. Runciman, Steven. A History of the Crusades: Volume 1, The First Crusade and the Foundation of the Kingdom of Jerusalem. Cambridge. 1987. ISBN 978-0-521-34770-9. Runciman, Steven. 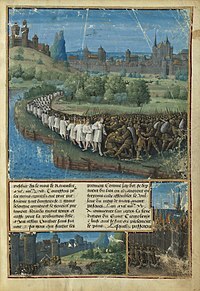 The First Crusade. Cambridge. 1980. ISBN 0-521-23255-4. Setton, Kenneth. A History of the Crusades. Madison. 1969–1989. Tyerman, Christopher. God's War: A New History of the Crusades. Cambridge: Belknap Press of Harvard University Press. 2006. ISBN 0-674-02387-0. Vryonis, Speros. 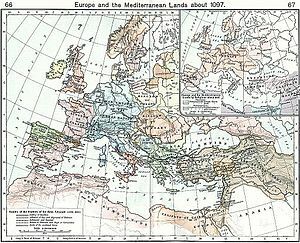 Decline of Medieval Hellenism in Asia Minor and the Process of Islamization in the Eleventh through Fifteenth Centuries. University of California Press. 1971. ISBN 0-520-01597-5.